If you are looking for a good SakeW (Japanese rice wine), one of the tips to find one is to look for the place where there are good rice fields, good water and cold temperature in winter. 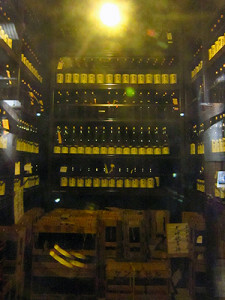 Hakushu has all the conditions for good Sake and ‘Yamanashi Meijo Co., Ltd.’ has been serving only Sake from 1750. 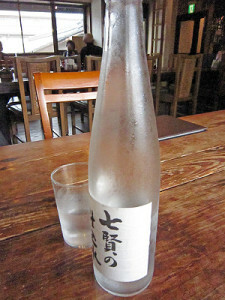 More famous by the name of their sake, ‘Shichiken’. 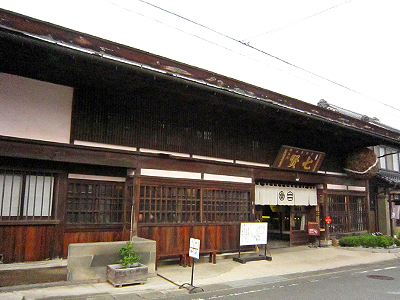 Located on the classic ‘Koshu-kaidoW’ high street of Daigahara where old buildings still remain, Yamanashi Meijo’s building is outstanding by its looks and size for they have been one of the important families of the area. 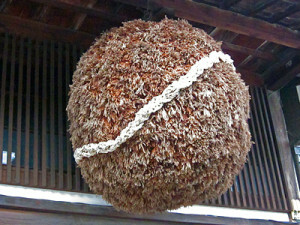 The symbol of their building is a big ball hanging from the ceiling of the roof outside made out of Japanese cedar branches, a good luck charm and where the god of Sake stays, made once every year as a wish of bringing up good Sake. 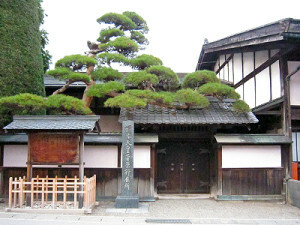 You can see they have two main entrances, one, for the guests to come in and the other with stiff wooden gate closed tightly which was for the Emperor. It was in 1880 that Emperor MeijiW stayed at Yamanashi Meijo while he was setting out a tour through Japan that the family head of Yamanashi Meijo at that time spent enormous amount of money to reform the rooms where the Emperor was staying including the special entrance. The gate and rooms were kept tightly closed until after the Second World War for they were thought to be sacred after the Emperor’s use. But because of such a strong feeling of loyalty to the Emperor and that the government officer sometimes came to check whether the room was kept sacred, the Japanese painted pictures of the room doors and decorated walls are still bright enough like those when new in late 19th century. 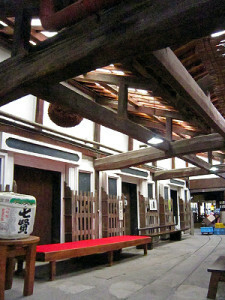 You can take a look inside of this building as well as trying out and buying their good varieties of Sake they produce. 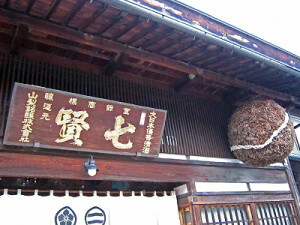 They also sell cup of ice cream made out of rice malt, non-alcoholic rice malt drink, soy sauce pickled WasabiW (Japanese horseradish) and some kinds of Sake related vessels and goods which can be good souvenirs. You would be astonished to see the dark black walls and thick wooden posts when you first enter the building which was once white, eventually turned into its colour for the soot from fires of cooking and air heating. 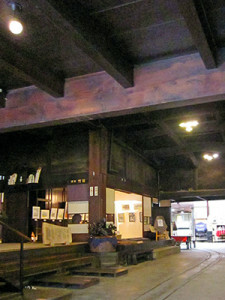 On the floor of the entrance lay small rails from the back of the building where the Sake breweries and the storehouse were to carry the heavy loads out onto the road to be carried out to the towns and villages. 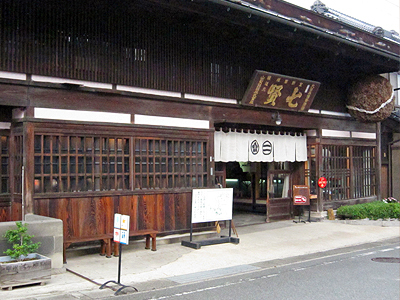 The old Sake brewery buildings still existing are similar to what you see in Yamanashi Meijo’s building but what is special about here is that they have kept the building as it was when Emperor Meiji has stayed. You can also find a shrine 200 meters away from Yamanashi Meijo where the tea jars of Tokugawa ShogunsW brought from Uji, KyotoW stayed. 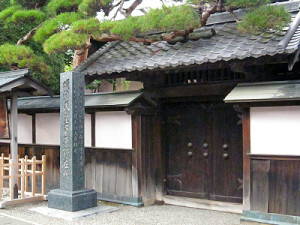 This place was also sacred not only because that the Shinto gods were there but also because the tea jars stayed! The present owner of the Yamanashi Meijo is the 14th generation from their founder and has started a restaurant ‘Daimin’ in the neighborhood in 2000. 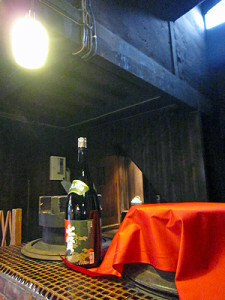 The restaurant is built in an old Japanese barn-style, a cozy space where you can first relax in a complementary bottled Hakushu water with which they produce Sake and choose neatly made real Japanese country menu. Unlike the Japanese dishes you see and eat in many places all over Japan which is influenced strongly by the Kyoto style, Daimin serves you with what the ordinal Japanese eat at home or cook when they have guests. Of course their dishes are neater than dishes that the Japanese cook for themselves, but if you want to know the daily dishes in the country side where old Japan still exists, Daimin’s menu gives you the right idea! They also sell a special Japanese boxed lunch in tourist season which is worth trying if you are going out on a picnic near the area. You need to reserve for the boxed lunch by 17:00 the day before. 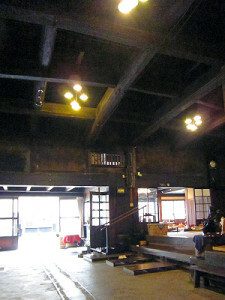 Address : 2283 Daigahara, Hakushu-cho, Hokuto-shi, YAMANASHI Pref. 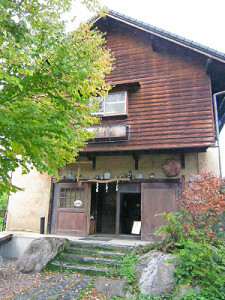 Address : 2287 Daigahara, Hakushu-cho, Hokuto-shi, YAMANASHI Pref. Closed : every Tuesday, and end-of year to New Year (31st Dec ~ 3rd Jan).